Recently, a Memorandum of Understanding (MoU) on Solar Energy Project was signed between the Punjab government and Germany’s Solar Power Project Development Firm in Berlin, according to which the German firm would work on a mega project for generation of solar energy in the province. The German delegation vowed to visit Punjab in November to initiate a solar energy project in the province. Terming the signing of MoU for establishment of solar energy project – in collaboration with the German Company in Punjab – a highly welcome step, Punjab Chief Minister Shahbaz Sharif said that vast opportunities of investment in the solar energy sector existed in Pakistan, especially in Punjab. He called upon German companies to assist Pakistan in finding new and sustainable methods for acquiring energy and said that the German technology was unprecedented in the field of solar energy throughout the world. Shahbaz said that the Punjab government would extend maximum possible facilities and incentives to the German companies as meeting the challenge of energy crisis in an effective manner was the top most priority of the Punjab government. Extending invitation to the German energy companies for making investment in the energy sector of Pakistan, especially Punjab, the chief minister said that large opportunities of electricity generation through coal, hydel and thermal existed in Punjab. “It’s the best thing I bought this winter,” says Sardar Azam, a former civil servant, showing off his water-heating solar geyser installed on the terrace. “The biggest advantage is that you spend money once and it runs on sunlight which is free,” Azam added. Pakistan needs to produce 16,000 megawatts of electricity a day but only manages 13,000 megawatts, according to the Pakistan Electric Power Company. The shortfall means that millions endure electricity cuts for up to 16 hours a day, leaving them freezing in winter and sweltering in summer while hitting industry hard, exacerbating a slow-burn recession. Voters say it is their biggest single concern, secondary to the war against Al-Qaeda and the Taliban, and so the government has been increasingly vocal about redressing the problem as it eyes elections within a year. “I think all our friends are encouraged to understand the real energy crisis that is in Pakistan. We can’t afford to be selective of where we receive our energy supply from,” Foreign Minister Hina Rabbani Khar said this month. At the time, she was referring to Pakistan’s determination to build a pipeline and import gas from Iran, regardless of US threats of sanctions, but the message was clear: on the energy front, Pakistan needs any help it can get. Arif Allaudin, who heads the Alternate Energy Development Board, would like to see more of that help coming from renewable sources, saying there was a 2.4 million megawatt potential for solar energy alone in Pakistan. 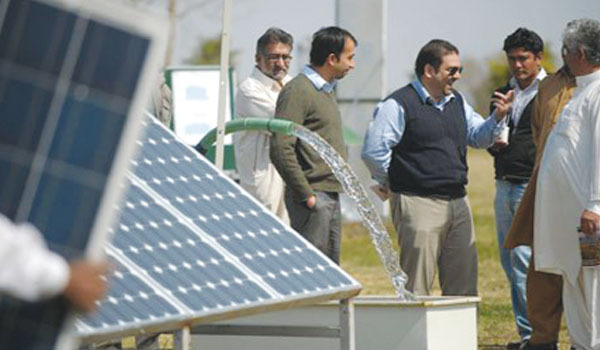 Niaz Ahmed Kathia, director of private company Alternate Energy Systems, said abundant and free sunshine was the answer to Pakistan’s energy woes. “Energy is our biggest issue, more than terrorism, and if we replace our one million tubewell pumps with solar ones, we can save 7,000 megawatts,”Kathia said at the demonstration of a solar well. The majority of Pakistan’s tubewell pumps, which pump out underground water, run on the strained national grid or on diesel power. There is no pretence that solar power is the only answer, but this month the prime minister ordered the government to provide solar electricity in remote villages far from the national grid. The government described renewable energy as the “investor’s choice” and said the private sector has offered to produce 1,500 megawatts a day. Solar street lights are also being installed slowly in cities such as Rawalpindi, Lahore and Karachi. Pakistan’s first on-grid solar power station, capable of producing 178.9 kilowatts, began test operations in Islamabad this month with a grant of $5.4 million from the Japan International Cooperation Agency. “It is a seed for thousands more solar power plants,” Senator Rukhsana Zuberi, a former chairperson of the Pakistan Engineering Council said. This winter Pakistan suffered a two billion cubic feet a day shortage of natural gas — usually the mainstay of millions delivered to homes and industry via pipelines — sparking protests and forcing factories to lay off labourers. The trouble is remedial plans are only at an embryonic stage. “We plan to promote the use of solar geysers as the gas shortage is becoming acute,” petroleum and natural resources minister Asim Hussain said. “The gas companies would install solar water heaters at consumer premises and deduct the amount in installments in the gas bills,” he added. Power generated during sunlight hours can be stored in deep cycle lead acid batteries to power lights, radios, televisions and fans at night. Norwegian company Telenor says it has set up 50 solar-powered cell sites, mostly in remote areas, capable of reducing 2.5 tonnes of carbon dioxide per site by saving over 940 litres of diesel a month. Traders say demand has certainly risen. A 170-litre (37-gallon) capacity solar geyser starts from 27,000 rupees ($300) and a 218-litre version for 32,000 rupees as a one-time cost. “Solar geysers can reduce gas bills considerably. The technology is not only environment friendly but also pocket friendly,” said vendor Shakil Ahmed. for any solar solution please contact me.